World Meatout Day is a day on which many consumers, nature preservers, ecologists and animal rights activists around the world promote a meatless nutrition. The goal of this action is to help the consumers develop a healthy, non-violent diet based on fruit, vegetables, grains and legumes on the first day of spring which symbolizes rebirth and regeneration of nature. On this day we ask the consumers to think about their nutrition, to think whether they would like to continue the insolent butchering of the innocent animals and consuming their carcasses or they would rather have a healthy, ethical and ecological nutrition which is called vegetarianism. 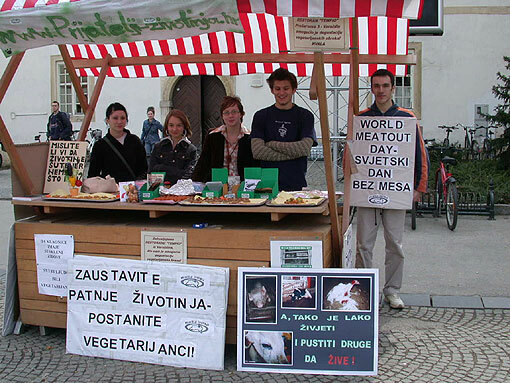 The action will take place in all the cities in which the branches of the organization are situated and our goal is to inform the public about vegetarianism through informative stands, leaflets, samples of vegetarian food, etc. We are asking you to be a part of the action that will take place on Saturday, March 20, 2004 at 11 A.M. Since March 22 is The World Water day, the damages that the meat industry causes in the waters on our planet will also be mentioned in this action. This year Meatout is organized all around the world in more than 20 countries: from the USA, Canada, Australia, the Philippines and Russia, to England, France, Italy, Israel, Portugal, Spain, China, and many others. As in the previous years, Meatout got the support of many celebrities this year as well. Some of them are Dirk Benedict, James Cromwell, Doris Day, Jennie Garth, Chrissie Hynde, Joaquin Phoenix, Ally Sheedy, and others. Since 1985 Meatout has grown explosively and became the world's biggest annual grass roots educational campaign on nutrition. When we think about giving up meat, we do it for the animals, our own benefit, world hunger, the nature and our whole planet.